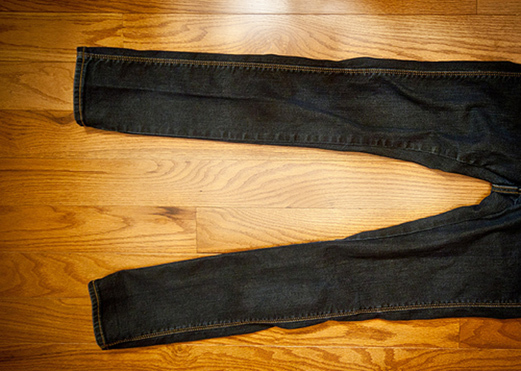 Were U.S. Catholics Raptured? ... Again? There are fewer Catholics in the United States now than in the past? When was the population ever higher? The claim in the PRRI report is incorrect. As I understand it, this may have just been a poor choice of words rather than something that the PRRI researchers literally intended to say or believed. Regardless, it is the kind of thing that gets picked up and then repeated in error by a religion reporter (example). Then your pastor reads it and puts it in a homily. Your great aunt posts it on Facebook. Before you know it this suddenly becomes "conventional wisdom." This already has become a classic of "conventional wisdom" in commentary on Catholic affiliation. You know, the Catholic Church is "hemorrhaging" members and their places are being filled by immigrants. Yet researchers rarely present data or do the simple math that would provide any evidence for how much immigration plays a part in the population dynamics. It just "has to be true." I have responded to different aspects of claims of membership decline and the effects of immigration in the past (1, 2, 3, 4) but I'll try to be more clear and present new data to show that this notion just does not add up the way it is imagined. It won't stop people from claiming this but maybe your great aunt will discover this post in a Google search and I can save her from making a misleading Facebook post. I try to do my part. The figure below includes three of the highest quality long-term series of surveys that we have to study religious change over time (...and you need a "moving picture" to do this. A one-survey snapshot is insufficient. Some knowledge of demography and attention to how religious affiliation varies over the life-cycle is also important). The first is Gallup’s religious affiliation data (details). In Gallup's 2011 surveys, Catholic affiliation among U.S. adults was estimated to be 23%. In its first observation of the series, in 1948, Gallup measured Catholic affiliation at 22%. For the series overall, this averages 25%. The second source is the American National Election Study (ANES). This survey’s sample (details) is based on citizens so if immigration is so important to maintaining the stability of the Catholic population percentage we should see a big drop in Catholic affiliation here. From 1948 to 2010 the Catholic share of respondents in this survey averaged 23% with 21% self-identifying as such in 1948 and 19% self-identifying as such in 2008 (the most recent data point for the ANES. Another will be released in a few months). The final series (details) has a shorter range. This is the General Social Survey (GSS) which began in 1972. Here, Catholic affiliation has averaged 26% for the series with an initial observation in 1972 of 25% and the most recent observation in 2010 of 25%. Differences within all three series are generally within margins of error. You'll find recent survey estimates for the adult Catholic resident population percentage typically ranging anywhere from 20% to 26% with occasional outliers in either direction. Taking any one of these surveys within this range and assuming that it is showing a decline or an increase would be bad science. Margin of error really does matter (more on this below). Thus, each of the three historical trends represent the stability that you can see in the figure below. The black line running through the figure represents a triangulated aggregation (by average) of these three Catholic population estimates. This smooths out some of the random variations (i.e., sampling error and occasional outliers) in each source and provides a more reliable estimate than relying on any one source. 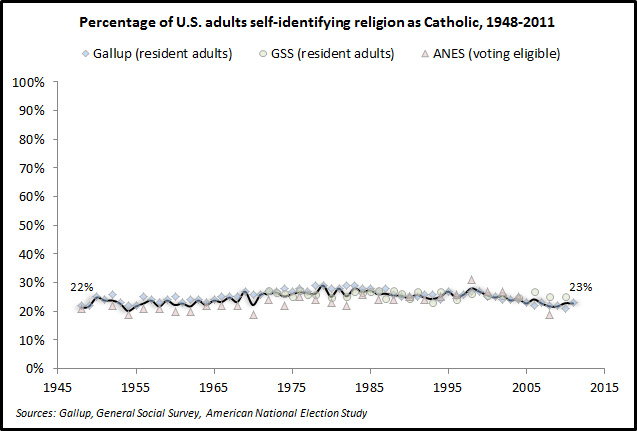 Of course a stable Catholic population percentage amidst a growing U.S. population means that the absolute number of adults self-identifying as Catholic over time is increasing. Even a decline in the population percentage does not always result in a decline in the actual population. A sub-group population can still be growing and adding net positive members but fail to grow as fast as the overall population and thus lose a percentage point or more. Below I will isolate changes since 1980, which coincides with the beginning of the most recent wave of immigration the U.S. has experienced. If immigration is the only thing "holding up" the Catholic population we should definitely see it clearly in the post-1980 period. The U.S. Census Bureau provides population estimates by year and by age group for the United States (and other countries) in a publicly accessible database (details). I collected adult population totals (those ages 18 and older) from 1980 and 2011 and multiplied each annual total by the aggregated Catholic population percentage for each year from the figure above. This results in the trend you can see below. Don't make too much of the sharp waves in the figure as these represent fluctuations within the margin of error from the surveys measuring Catholic affiliation. With these data the adult Catholic population, as measured by self-affiliation, is estimated to have grown by 32 percent from 41.3 million in 1980 to 54.7 million in 2011. It is not possible to measure the change in the under-18 Catholic population. However, The Official Catholic Directory records 30.4 million infant and child baptisms between 1980 and 2011 with 17.8 million of these occurring since 1993 which are not yet "visible" to national polls that almost always use adult samples. Some of those baptized will no longer affiliate themselves as Catholic later in life as we know that a good chunk of those leaving the Church do so in their youth. Some return when they are older as "reverts." These reverts, as I will explain below, are an important part of the story of how the Catholic population percentage has maintained stability. How much of this increase in affiliation is related to immigration? Another question frequently asked in surveys is country of birth and parents' country of birth. Below, I use these from the GSS and Pew's Social and Demographic Trends survey for 2011 to estimate the impact of immigration (Note: the GSS is not fielded every year and in recent years shifted to being done every other year. With the exception of 2011, I have interpolated any other missing year using data from the neighboring years. This is a reasonable method as the distribution for place of birth does not shift annually in the aggregate like attitudes can). The figure below breaks out the adult Catholic population into three stacked groups. The first are those born in the U.S. to native-born parents. The second are those born in the U.S. who have one or both parents born outside the U.S. The final group includes all those who are foreign-born. The adult Catholic population born in the United States to native-born parents grew by 24% from 1980 to 2011 from 27.4 million to 34.1 million. 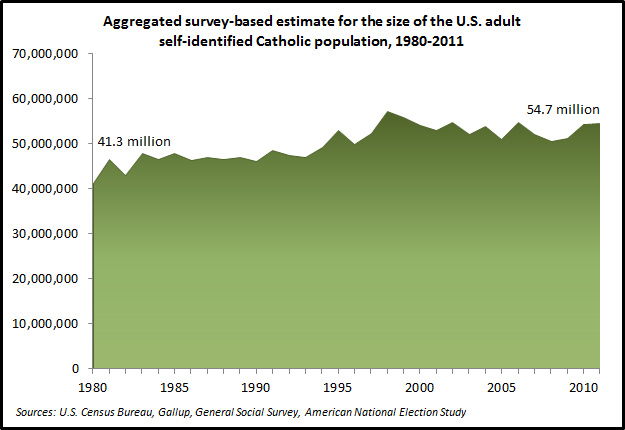 This population is not in decline as many assume and continues to make up a majority of the U.S. adult Catholic population. The number of U.S. adult Catholics who are foreign-born or native-born children of at least one foreign-born parent grew from 13.9 million in 1980 to 20.6 million in 2011. This represents a 48% growth rate. Not all of this growth is directly related to immigration and some of this is linked to differences in fertility rates. For example, the 2011 birth rate (i.e., births per 1,000 women ages 15 to 44) for Hispanic females was 17.5 compared to 10.8 for non-Hispanic white females. It is clear from the figure below that the Catholic population has gained some membership through immigration and the children of immigrants throughout the period (it should also be noted this statement would be true for most of American history in regards to Catholics and for some other religions in recent decades as well—including Nones. With native-born fertility rates falling below replacement, there are a variety of groups that now grow primarily through a combination of immigration and generational replacement). However, it is also the case that this growth is insufficient to explain the whole "paradox." More interestingly the percentage of adult Catholics indicating that they were born outside the U.S. is now in decline (since 2007) and the adult Catholic population percentage has continued to remain stable. This has occurred as immigration rates from Mexico have collapsed (1, 2). The figure below shows the breakdown of the adult Catholic population by place of birth in 2011. 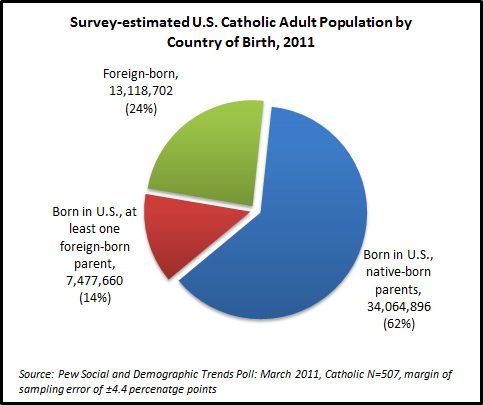 About a quarter of adult Catholics (24%) are foreign-born representing 13.1 million individuals. 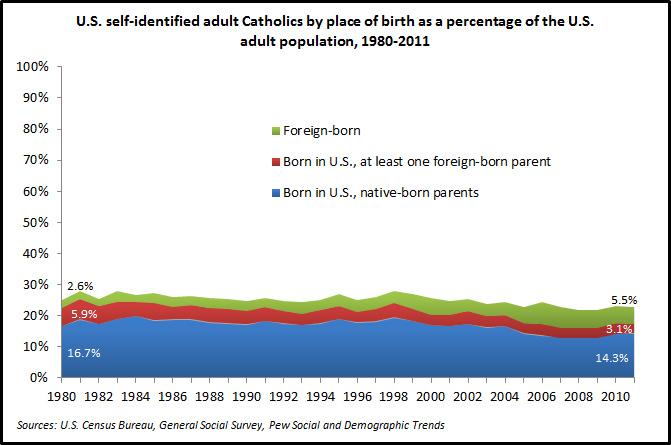 This is up from 10% of Catholics being foreign-born in 1980. This is certainly part of the Catholic population growth story but it is also clearly not the only story or perhaps even the biggest story in the numbers. In 1980, 66% of adult Catholics were born in the United States to native-born parents. In 2011, this segment consisted of 62% of adult Catholics. Also of interest is the declining numbers of Catholic adults who report that they are a child of a foreign-born parent(s) (i.e., 23% in 1980 and 14% in 2011). This may represent those who were children of the last waves of European immigration from the early 20th century passing away. The figure below shows how the proportion each group adds up to the total Catholic population percentage (i.e., summing the numbers equates the U.S. adult Catholic population percentage that was 23% in 2011. Note that the PRRI measurement of 22% is not statistically different from 2011). You can see there is a declining percentage for native-born Catholics due to their slower growth rate, but again the numbers of these individuals is growing in the aggregate population as shown above. Immigration has contributed to the stability of the Catholic population percentage, as shown above, but not nearly to the degree argued by many (...Pew's 2007 data shows specifically that there are not enough foreign-born Catholics in the population to make up for the numbers of native-born Catholics who are estimated to have left. These data also document that a sizeable number of those who have left Catholicism are foreign-born. Note there is a difference between the results in Pew's report and what one can find in the data that are publicly available. No researcher is ever able to include a completely comprehensive analysis of their data in a single report). Thus, on the second statement highlighted above, I believe PRRI is simply putting too much emphasis on foreign-born Catholics to solve the paradox (...and they certainly are not alone in doing so). At the same time, I will reiterate that the PRRI statement is absolutely factually incorrect in claiming that the Catholic Church in the United States has experienced a decline in members (...even if one wanted to stretch to a "decline" in parish registration this would still be inaccurate as many young Catholics and Hispanic Catholics do not register but are still attending Mass with some regularity. We know this at CARA because we have surveyed more than 385,000 Catholics in-pew, during Mass to date). 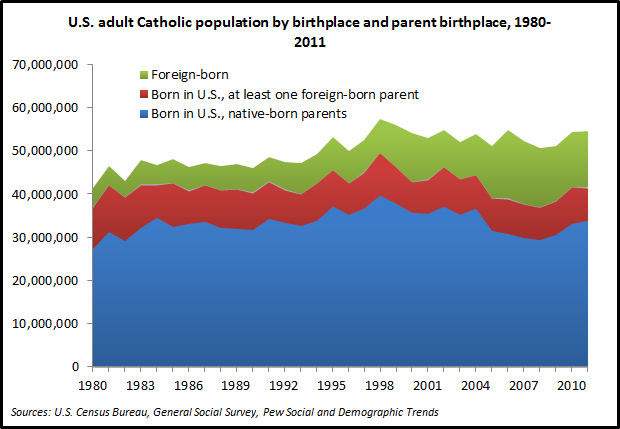 It is also incorrect when others make the assumption that there are fewer native-born Catholic adults with native-born Catholic parents now than in the past and that this group is declining in number (...someone let Robert Putnam know). So what makes up the difference? Most pollsters don't think much about demography and seem to forget that there is an important population that is not often in our view. Polls are generally done with adults ages 18 and older. Here lies some of the briefly "disappearing Catholics." Consistent with CARA's own surveys, Pew notes that "Almost half of Catholics who are now unaffiliated (48%) left Catholicism before reaching age 18" (i.e., before they ever enter the population we regularly survey). Notice that PRRI estimates that those raised Catholic are equivalent to 31% percent of the population (p. 9) and Pew similarly estimates this to be 31.4% (p. 26 of the Religious Landscape report). Yet, as shown previously, the Catholic population percentage has never actually been 31% since the 1940s (...or in any earlier period of U.S. history). Some insight into teen religious affiliation can be seen in a recent CARA study. We conducted a national survey including an over-sample of 677 teens, ages 14 to 17, in Catholic households. Their Catholic parent(s) provided permission for their children to respond. Of this group CARA found that 174 or 26% did not self-identify as Catholic even though their parent(s) do and presumably some are unaware of a change in their child's affiliation. Many of the teens who leave their childhood religion grow up and continue to have no affiliation or join another faith. But as noted previously some come back to the Catholic Church later in their lives as "reverts" or returned Catholics (...and this is nothing new as Hoge et al. wrote about the topic in 1981). 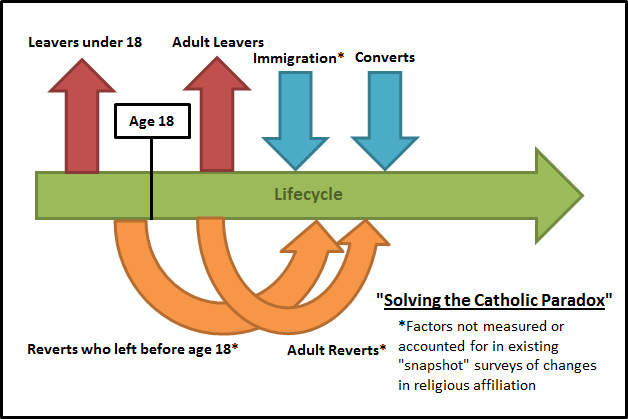 The complete solution to the "paradox" of the stable Catholic population percentage is a combination of immigration and fertility effects along with minors raised in the faith who leave as teens and later return to the faith most often in their 30s and 40s. To better understand the revert process in more depth one would need a panel study which includes children or teens who are interviewed in their youth and again at later points in their life as adults. These surveys exist but it is unlikely that many include a religious affiliation question. If the U.S. Census asked religious affiliation this would also help us understand these life-cycle changes as well. We do know reverts are in the Catholic population and in the pews. They tell us so when we ask. CARA surveys estimate there are more than 5 million Catholic reverts nationally (i.e., equivalent to 9% of all adult Catholics). PRRI or Pew don't "see" them because the structure of their questions do not allow them to. Both have asked for a respondent's current affiliation and the affiliation they were raised in. If I grew up in a Catholic household, stopped affiliating as such for a time, and later came back I would look like a "cradle Catholic" in their polls even though I had "switched" out for a time. Also there are many who were raised Catholic but who are now unaffiliated (leaving as minors) who will return to the Church in the future contributing to growth of the adult population (i.e., if history continues to repeat itself... and it may not. If it doesn't the Catholic population will likely be in decline). We can see reverts in other Catholic populations as well. For example, Ireland asks about religion in its census. This is broken down by cohort in the table below across 20 years. The first row of the table isolates the cohort born between 1987 and 1991 who were under 5 in 1991. We can follow this group ten years later seeing their numbers when they aged 10 to 14 and finally can examine their population total when they are 20 to 24. 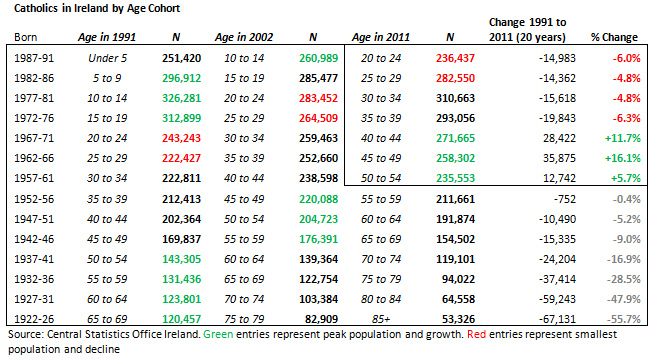 The first four cohorts including those under 40 are all showing a decline in population. But then we see growth in the next three cohorts among those who are currently ages 40 to 54. Each cohort is lowest in numbers when they are in the 20 to 29 age range. The same thing happening again and again in the same way (i.e., unlikely to be related to something like changing patterns of immigration). Each experiences growth from their 20s into their 30s. For example, the cohort born between 1972 and 1981 showed losses as they reached their 20s and growth moving into their 30s. It's hasn't yet been enough growth to wipe out the losses from the 20s, but if this group is anything like those born 1962 to 1971 they should be back in positive territory in 2021 in their 40s. A final note... PRRI did not provide much information in the report about margin of error and statistical significance other than the overall N and margin of error. This N is printed under every figure even though this cannot be reflective of some of these (e.g., anything summarizing results for likely voters). I estimated my own sub-group margins of error for the report (here). There are several findings in the study where I really wonder about statistical significance. For example, the researchers really had to stretch the data thin to get to likely voters by religion and race and ethnicity. When a national random sample survey has 3,003 interviews it is difficult to drill down to the levels this report tries to get to without having to deal with very large margins of error. At the same time, I will note that this practice is not uncommon among some pollsters and social scientists (...it just makes it more difficult for readers to parse out the most meaningful findings). For example, the 2006 Faith Matters survey used by Robert Putnam and David Campbell in American Grace: How Religion Divides and Unites Us includes a sample of only 212 Hispanic Catholics (sub-group Ns and margins of error were not published in the book). There was a lot made of differences between Hispanic Catholics and non-Hispanic Catholics in that book based on very few interviews and readers were never made aware of this (...I have noted my skepticism of some of their findings previously). I think any research organization that is releasing data that they intend to be read by the media and disseminated to the public needs to be very careful about what is put into print. Saying the the Catholic population has declined significantly is going to be something that catches the eye of religion reporters and regurgitated. When that statement is false and people are misled, even when it is unintentional, it can't effectively be "pulled back." Reporters don't write a new story and even if they issue corrections these receive little notice. Similarly I think it is important that researchers provide some context of differences and changes that are statistically significant and those that are not. Reporters and the public tend to take even the slightest differences within polling far too literally. Science is about helping people understand the realities of this world. We shouldn't cloud this with results that are incorrect or insignificant. 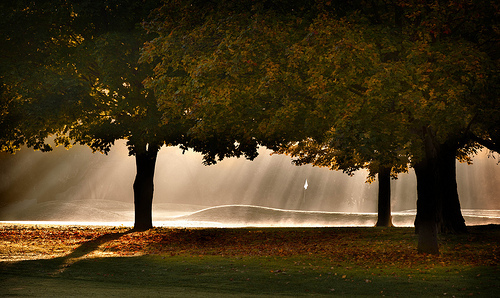 Photo above courtesy of Patrick Gage from Flickr Commons. There will certainly be more polls released before election day but absent any substantial October surprise I would not expect to see any big shifts in Catholic voting preferences. My analysis from a Catholic Vote session with others on Monday remains the same. In my opinion it is too close to call. This election may end up being similar to 1988 or 2004 where polls disagreed on which candidate won more Catholic votes (...both those elections involved candidates who had served Massachusetts). 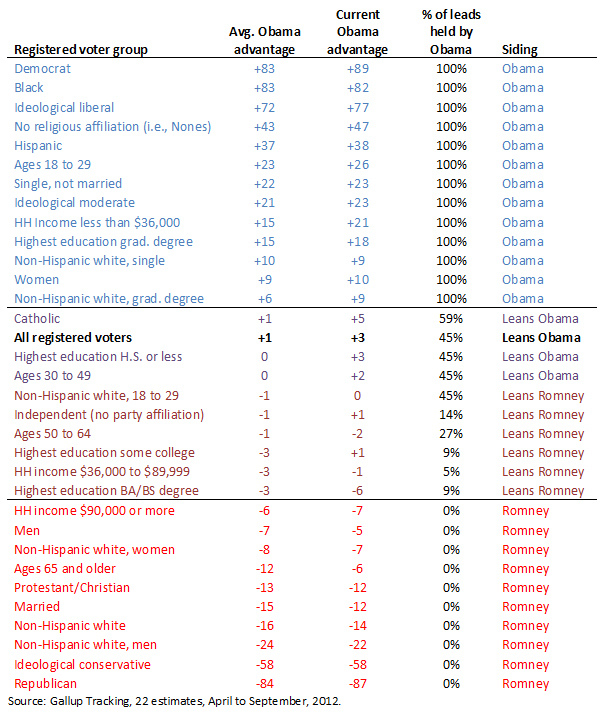 President Obama has an edge among registered voters but loses this advantage among likely voters. Turnout among different Catholic sub-groups will determine who attracts the more votes. 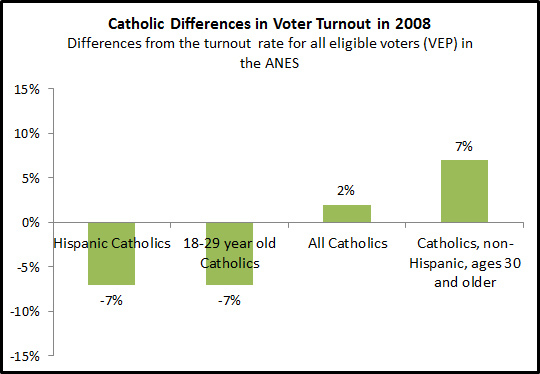 Even in a high turnout election in 2008, Hispanic Catholics and young Catholics, who tend to vote for Democrats in great numbers, had lower turnout rates than older and non-Hispanic voters (although the magnitude of these differences is fuzzy given margin of error). Surveys on intention to vote mirror what we saw in 2008 with Hispanic and younger voters indicating they will remain less likely to vote. Catholic sub-groups who tend to vote Republican (i.e., weekly Mass attenders) are more likely to vote which may give Gov. Romney an edge in the end. I do think the Catholic vote will likely maintain its bellwether status and follow the popular vote closely. One thing to watch closely in an election that seems to be primarily about economic issues and jobs is the final unemployment data that will be released before the vote. Gallup's tracking on unemployment might offer a preview of what will be reported. However, some good news in this report last month did not provide a boost for the President in the polls. Stay tuned as CARA will certainly have post-election analysis. However, with Exit Polls being cut this may take a few weeks to collect enough data from a variety of polls to have some confidence in what actually happened. Update 10/31: Greg Smith from the Pew Forum on Religion and Public Life mentioned that although some state Exit Polls were cut that there will still be a National Exit Poll conducted. It is not clear what sample sizes will be available or how many forms will include a full religious affiliation question but it will still be possible to have an estimate of the Catholic Vote after the election. There is of course one very safe prediction that doesn't rely on polling. We will have a Catholic VP. From academics to popular culture there is certainly no shortage of election prediction models to choose from. This year Nate Silver's daily calculations, the "wisdom of crowds" at Intrade, and the predictions of University of Colorado at Boulder political scientists have received a lot of attention (...you might also want to pay attention to the Washington Redskins game against the Carolina Panthers on Nov. 4). My favorite model is simply the Catholic vote. A classic bellwether, as this bloc goes so too does the electorate (...I'm not arguing this is determinative—just highly likely). We've been tracking the preferences of Catholic registered voters for weeks now. President Obama has maintained an edge here and currently leads 49% to Gov. Romney's 45%. But voter registration deadlines have now passed in many states and polling has now shifted to likely voters. This puts a new frame on the race for the Catholic vote. Using this as a prediction model and borrowing a golf metaphor, the president enters tonight's debate on the 16th hole, two strokes off the lead. Mitt Romney has a slim edge among Catholic likely voters and he's actually had this edge for quite some time. The figure below aggregates eight different polls, from three different pollsters, over the last three months. Gov. Romney has led in seven and tied in one. He has never trailed during this period. Now technically these "leads" are well within margin of error but the consistency across time and pollsters leads one to believe there is likely a real lead here. How can a lead flip moving from registered voters to likely voters? 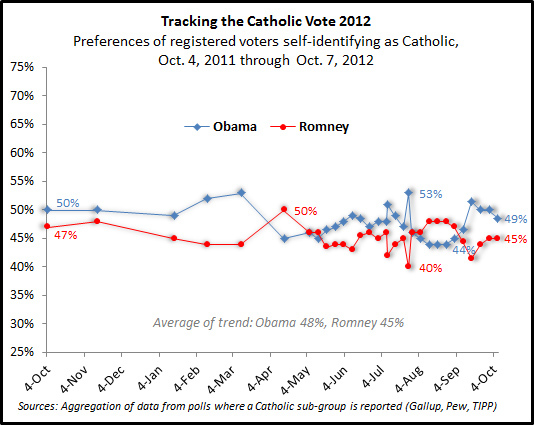 Currently, Catholics favoring President Obama are indicating lower likelihoods of voting than those favoring Gov. Romney. As we've shown previously, Hispanic registered voters and those ages 18 to 29 are among the least likely to indicate they will definitely vote in November. As early voting began a few weeks ago this election became all about turnout and mobilization. 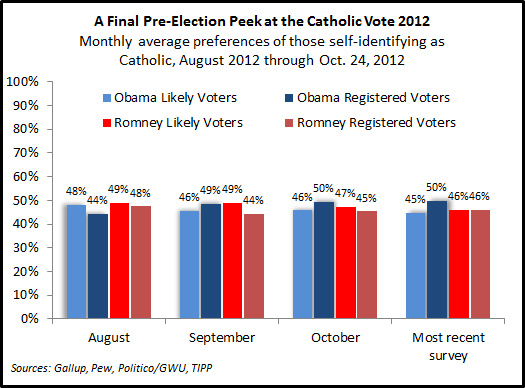 Polls are indicating the Romney campaign is doing a better job at mobilizing Catholic voters. What will bring people to the polls? 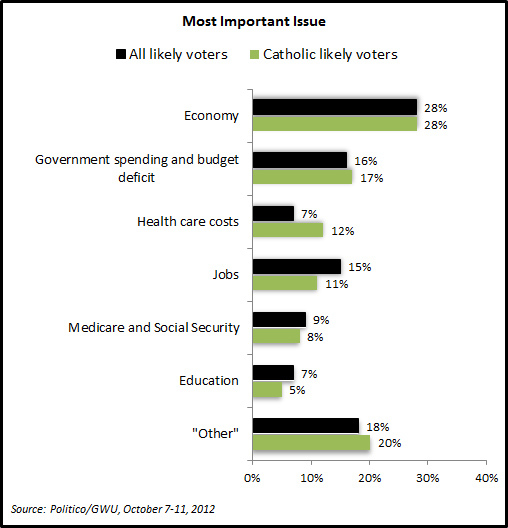 Catholic likely voters have similar concerns as those of the overall electorate citing the economy as their most important issue followed by government spending and the budget deficit, health care costs, and jobs. The president will certainly try to make up ground in tonight's debate on these issues. The debate is in the town hall format and both candidates will be asked questions from an audience of undecided voters selected by Gallup. In my opinion (disclaimer: I am not registered to vote and do not support either candidate), one of the Obama campaign's biggest successes is also turning out to be a challenging issue in the debates. The campaign spent so much time effectively attacking the governor on everything from his treatment of a family pet to Bain Capital to his misbehavior as a school boy that they ended up creating a one-dimensional character that does not reflect reality well. Just taking the stage and not appearing as an "evil" Thurston Howell is a win for Gov. Romney in each debate. The debates also tend to be about issues, policies, and records instead of the personality-based content the Obama campaign has so heavily focused on. I also think the president's dearth of press conferences or interviews with journalists who might sufficiently challenge him (with a few exceptions) provided little practice for the tough questions and sparring in these debates. Although going on The View and The Late Show with David Letterman is great use of free and popular media it is also a bit like preparing for the national championship by playing a few Division III schools (...sorry more sports metaphors). Photo above courtesy of Out of Chicago from Flickr Commons. -The article is wishful thinking. So where are they? -Obviously it’s wrong else how could you explain the Los Angeles Archdiocese, the largest, wealthiest Archdiocese in the world can’t field more than a small handful of priests each year. This report never implies in any way, “problem solved.” This study was not commissioned to prove there is no problem or to make people feel good. The fact that it was commissioned at all is because there is a pressing problem. The Church has a declining number of priests and vowed religious and the current numbers of people choosing a vocation is insufficient to meet the Church’s future needs. It is also the case that the Church’s population of priests, religious brothers, and religious sisters lacks the racial and ethnic diversity of the U.S. Catholic population. Why is this happening? We are the Center for Applied Research in the Apostolate. This name fits well because we do applied research. We’re not like the Pew Forum on Religion and Public Life, which conducts and releases research to advance public knowledge and awareness. Most often we are doing research to assist a client in dealing with a problem or challenge. Our goal with the vocations study was simply to find out who is interested in vocations and how they became interested to help the Church better understand this process. -I too find these statistics possibly misleading. I “seriously considered” seminary myself about 3 or 4 years ago; I know two others who did as well. Of the three of us, one has married, I’m still single, only the third has actually begun seminary studies. I even visited a seminary. Yes, it would be misleading if one assumes that consideration of a vocation means that this person always follows through on this. The study obviously never makes such a claim. One of the more troubling aspects of conducting research that gets released to the public is in knowing that many will read a news story and very few will ever see the broader report and thus some will end up making some invalid assumptions. This project was the first in a number of studies CARA is conducting examining the vocations process. In the most recent report we focus on the beginning—looking to the moments when people initially consider a vocation. More CARA research will be released soon that addresses some of the other hurdles “in the way” and how those interested in vocations are dealing with these. It won’t always be good news (e.g., see this CARA study on student loan debt and vocations). One of the most important factors leading to the consideration of vocations is you (and at least two of your close friends, family, and fellow parishioners). We’ve noted before how damaging discouragement can be. It turns out encouragement is equally powerful (...and positive). Those who have had three or more people encourage them to consider a vocation are significantly more likely to become interested in this. The bad news here is that many Catholics don’t or won’t encourage vocations. In the study we asked respondents who said they have not and would not encourage why this was the case. 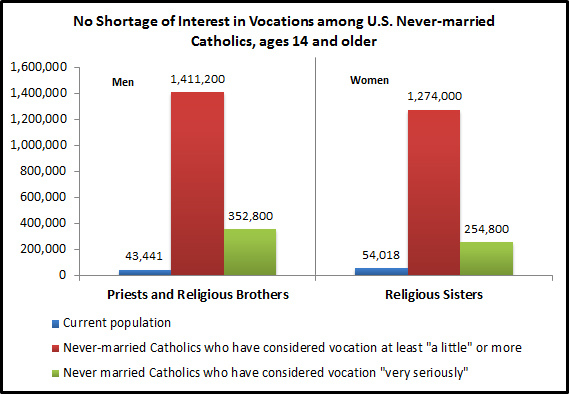 The most common answer given was that this is an individual decision and “none of my business.” The figure above shows you just how many Catholics become interested on their own (i.e., considering a vocation “a little” seriously or more). A report like this is made public so that all the Catholics out there who are concerned that their parish may not have a resident priest in the future or that the school has no more religious sisters on staff will now know that they are part of the process. Only a fraction of those who consider vocations follow through on this interest. 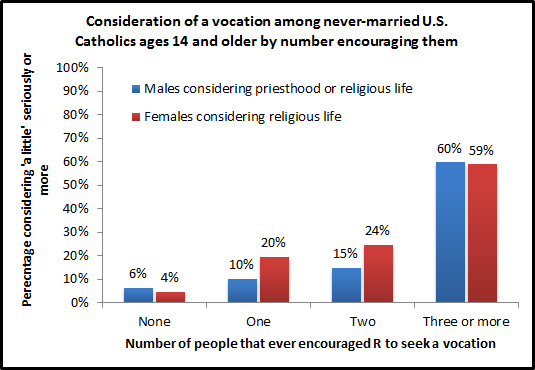 More people making it just to consideration will likely lead to more vocations overall. Thursday's VP debate will be the first with two Catholic candidates from opposing parties meeting in a televised national election forum. As they meet, the "Catholic vote" is back to "too close to call" with President Obama leading among all Catholic registered voters (49% Obama to 45% Romney) and Gov. 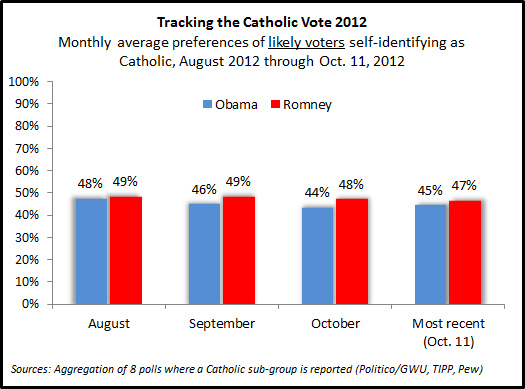 Romney leading among all likely Catholic voters (50% Romney to 44% Obama). This week's new data are from two sources; Gallup and Pew (their estimates are averaged in the figure below). Likely voter estimates are now revealing the importance of enthusiasm and turnout for the eventual outcome. Currently, 84 percent of Catholic registered voters say they will definitely vote in November. It's unprecedented for two Catholic candidates to face off in a national forum that is likely to be so heavily watched. It will be interesting to see if faith becomes part of the discussion and if the debate moves the Catholic vote one way or the other. Note: A more current update on the Catholic vote has been posted here. We've focused on Catholics' consideration of vocations before. But we've never had a whole survey devoted to the topic... until now. In winter 2012, the Secretariat of Clergy, Consecrated Life and Vocations of the United States Conference of Catholic Bishops commissioned CARA to conduct a national poll of never-married Catholics ages 14 and older regarding their consideration of a vocation. CARA partnered with GfK Custom Research (formerly Knowledge Networks) to conduct the survey in May and June 2012. The survey was completed by 1,428 respondents (resulting in a margin of sampling error of ±2.6 percentage points). The study, available online now, has many surprises. Although many speak of priest shortages and steep declines in the number of men and women religious, the survey reveals that there is no shortage of individuals who seriously consider these vocations among never-married Catholics in the United States. Three percent of men say they have "very seriously" considered becoming a priest or religious brother and 2 percent of women indicate they have "very seriously" considered becoming a religious sister. This is equivalent to 352,800 never-married men and 254,800 never-married women. Millions of never-married Catholics are estimated to have considered these vocations at least "a little seriously" based on the survey results. The study utilizes a form of regression analysis to sort through these different influences (and more) to isolate those that are most important and influential. Among male respondents, after controlling for all other factors, those who attended a Catholic secondary school (grades 9-12) are more likely to have considered becoming a priest or religious brother. Compared to those who did not attend a Catholic secondary school, these respondents are more than six times as likely to have considered a vocation. Participation in a parish youth group during primary school years (grades K-8) is also strongly related to vocational consideration. These respondents are more than five times as likely to consider a becoming a priest or religious brother than those who did not participate in a parish youth group. Given that 75 percent of male respondents who have considered a vocation report that they first did so when they were 18 or younger, these two results provide some of the strongest evidence of a possible causal effect. Encouragement from others is also important. Respondents who have one person encouraging them are nearly twice as likely to consider a vocation as those who are not encouraged. Each additional person encouraging these respondents increases the likelihood of consideration. The effect is additive. Respondents who had three persons encourage them would be expected to be more than five times more likely to consider a vocation than someone who was not encouraged by anyone. Knowing someone who has become a priest, religious sister or brother, or seminarian also has a positive effect. Respondents who personally know one of these individuals are more than one and a half times more likely than someone who does not to consider a vocation themselves. This effect is also additive and knowing more of these individuals would be expected to increase the likelihood of a respondent considering a vocation. Attendance at World Youth Day or at a National Catholic Youth Conference has a positive effect for male consideration of a vocation. Those who attended either of these events are more than four times as likely as those who have not to say they have considered becoming a priest or brother. Finally, those who have recently used traditional media (television, radio, print) to access content about religion or spirituality in the 12 months prior to the survey are more likely than those who did not to say they have considered a vocation. Note however, that this media use in most cases occurred well after their initial consideration. Thus, what this more likely demonstrates is that people who have considered a vocation are more likely than those who have not to use traditional media to currently follow religion and spirituality content. Those who have used one type of traditional media in the last year are nearly twice as likely to say they have considered a vocation than those who have not used these media recently. The effect is additive, so use of two or three traditional media to access religious or spiritual content is associated with an even greater likelihood of vocational consideration. This finding is potentially useful in understanding how male never-married Catholics who have considered becoming a priest or religious brother can be reached now. Note that neither generation nor race and ethnicity are statistically significant in the full model. Thus, there is nothing about a person’s age or race and ethnicity that are associated with lower or higher likelihoods of consideration, controlling for all other factors. Any disproportionality in the race and ethnicity of men who decide to become priests or religious brothers are in part likely to be related to being less likely to attend Catholic schools or to be involved in youth groups, comparatively lower levels of encouragement, or not personally knowing clergy or religious. This could also be related to factors that are important after consideration of a vocation is made by individuals, such as meeting requirements for entry into a formation program. Among female respondents, the model predicting consideration of becoming a religious sister includes many parallel results to the model for male respondents. Whereas secondary school is important for male vocational consideration, it is attendance at a Catholic primary school which is important for female vocational consideration. Female respondents who attended a Catholic primary school are more than three times as likely as those who did not to consider becoming a religious sister. Parish youth group participation is also important for female respondents. However, unlike males, it is participation during high school years rather than primary school years that has an effect. Women who participated in a parish youth group during these teen years are more than nine times as likely to consider becoming a religious sister. Similar to male respondents, encouragement is also a positive factor. With nearly the same effect as is demonstrated among men, women are nearly twice as likely to consider a vocation when encouraged by another person to do so. Also parallel to men, women who have used traditional media in the last year to consume or follow religious or spiritual content are more likely than those who do not to say they have considered a vocation. Among the adults surveyed (excluding those ages 14 to 17 in the sample) who say they have considered a vocation, most report that they did so between the ages of 13 and 24. Additionally, one in four Catholic females who have considered becoming a religious sister did so before they were a teenager. Although most Catholics who are becoming priests, religious brothers, or religious sisters now are typically in their 30s or even older, it is likely that the roots of these vocations were established in their teen years or even earlier. Respondents who said they had never considered a vocation were asked in an open ended question, “Why do you think you have never considered this?” Their responses to this question were coded into categories based on their content. 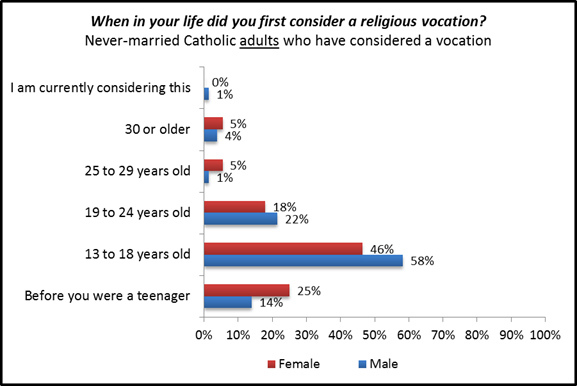 Among male respondents who have never considered a vocation as a priest or religious brother, the most common responses to the question were related to a general lack of interest (39 percent), celibacy (18 percent), not having a calling to seek a vocation (8 percent), having other life goals (8 percent), and having some doubts about their faith or not feeling religious enough to seek a vocation (8 percent). One percent of comments referenced the issue of sexual abuse of minors by clergy. Among female respondents who have never considered a vocation as a religious sister, the most common responses were related to a general lack of interest (31 percent), celibacy (16 percent), not having a calling to seek a vocation (11 percent), discomfort with the lifestyle they would need to adopt (10 percent), and having some doubts about their faith or not feeling religious enough to seek a vocation (9 percent). In August, CARA released a report profiling the demography, background, and views of the people who work for or who are volunteers in U.S. Catholic parishes as part of the Emerging Models of Pastoral Leadership study. A revised version of that report is now available including breakdowns of the data specific to Lay Ecclesial Ministers (LEM). These are vowed religious and other lay people who are in parish ministry for 20 hours or more per week (most often paid and most often having had some form of professional training. Visit here for more about the background of lay ecclesial ministry). The number of LEMs has grown by more than 16,000 in the last two decades (+76%) and these ministers now total nearly 38,000. The gender make-up of LEMs has been quite stable over time and most LEMs are female. However, there has been a big shift in how many are religious sisters. Two decades ago more than four in ten LEMs were vowed religious (mostly religious sisters with a small number of brothers serving in this capacity as well). Now, only 14 percent are religious sisters or brothers. One effect of this shift is that the percentage of LEMs with graduate or professional degrees has dipped slightly in the past decade (53% in 1992 to 46% now). The median age has dropped as well (58 in 1992 and 55 now). 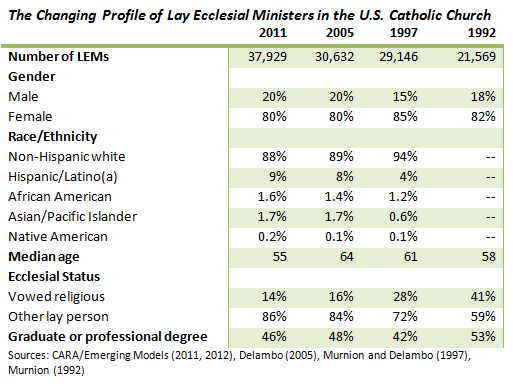 LEMs have also become more racially and ethnically diverse. About one in ten in 2012 self-identify as Hispanic or Latino. There are other interesting nuggets in the new data that cannot be compared cross-time with the earlier studies. For example, the median annual salary reported by paid LEMs is $35,000 compared to $28,000 for all others in paid ministry or service to a parish. Eight in ten LEMs (79%) say they are either "somewhat" or "very much" satisfied with their ministry wages or salary. Most LEMs are living in households with others earning incomes or they are working second jobs themselves (20% have other non-ministry employment outside the parish). Two-thirds (64%) live in households with a combined income of at least $55,000. On average, LEMs work more than 40 hours per week in their parish and one in four (24%) agree "very much" that they often feel overworked. Half of LEMs say their overall satisfaction with their parish is "excellent" and 42% say this is "good." Sixty-one percent of LEMs agree "somewhat" or "very much" that they wanted to be involved in parish ministry when they were growing up. Six in ten (60%) attended a Catholic primary school (K-8), 47% went to a Catholic high school, and 58% have attended a Catholic college, university, or seminary. Eight in ten (79%) entered ministry to be of service to the Church. Three in four (73%) say they did so answering God's call. Nine in ten (89%) agree "very much" that their ministry is a vocation and not just a job. The last polling update before the debates... Gallup's weekly demographics are out without any other companion polls reporting Catholic vote estimates recently. With a final fielding date of Sept. 30 (the most recent available), Catholic registered voters nationally favor President Obama 50% to 45% over Gov. Romney. This is the second consecutive week in which the Catholic vote narrowed. The current estimate is very similar to the first estimate of the race a year ago where Obama led Romney 50% to 47%. On average, for the series, Obama has led Romney 48% to 45%. The percentage of registered Catholics indicating they are "definitely voting" reached a series high this week of 84%. The voting preferences of Catholics remain a bellwether mirroring national estimates. In 22 demographic breakdowns provided by Gallup since April, President Obama has led Gov. Romney among Catholic voters 59% of the time with an average advantage of +1 percentage point (Gallup estimates differ from those above as CARA's tracking includes estimates from any available survey reporting data for Catholic registered voters; aggregated through averaging). In addition to being a bellwether the Catholic vote could also be considered a "swing" sub-group that has not consistently polled in one direction in this election season. The table below puts the Catholic vote in this context compared to other sub-groups of voters in Gallup's surveys. The top block of the table, in blue, are groups where Gov. Romney has never led, which President Obama is likely to win. The bottom block, in red, are groups where President Obama has never led, which are likely to be won by Gov. Romney. There are a few groups that may be a bit surprising to some. The first is seniors, those ages 65 and older. Democratic Party candidates have not won this group since 2000 (i.e., in national exit polls) and President Obama does not look likely to win it in 2012 even with his campaign focusing heavily on Medicare, Social Security, and Rep. Paul Ryan's budget plan in an attempt to bring this group back into the Democratic Party coalition. The second interesting group are those in households earning $36,000 to $89,999. This is the closest approximation one can arguably make in the breakdowns that reflects the "middle class." Despite this group being a major focus of the Democrat's campaign and party platform it is leaning toward Gov. Romney. President Obama has only led Gov. 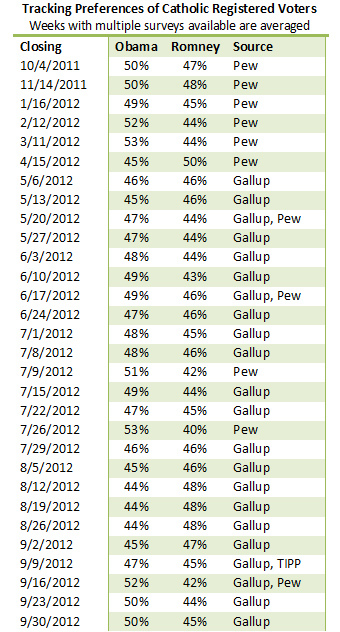 Romney once in Gallup's sub-group tracking summaries among this income group (i.e., Sept. 3-23). The President is currently down a percentage point (technically tied) with this group but the overall trend gives an advantage to Gov. Romney. Finally, although many envision ideological moderates as being in the middle of the political spectrum, they are not in the middle of the electorate in terms of voting preferences. President Obama is leading strongly among this group by +23 percentage points and has led here in all of Gallup's estimates this year. Of course no one wins electoral votes for winning a demographic sub-group of the electorate! In the end, the swing states are what really matter now. However, within those states demographics will be key. In reviewing recent swing state polls CARA estimates that there are more than 5 million Catholic registered voters combined in Colorado, Iowa, Florida, New Hampshire, Ohio, and Virginia representing about 24% of key "swing" electorate for 2012. Note: A more recent update on the Catholic vote has been posted here.